Little 1 is really showing a love for reading at the moment and having read Rent a Bridesmaid by Jacqueline Wilson and liking the book she was looking forward to reading a new story by the same author that we had also been sent to read. This time it was the turn of 'Katy'. Taking inspiration from the classic novel 'What Katy did' Jacqueline Wilson has created a modern Katy for the twenty first century. 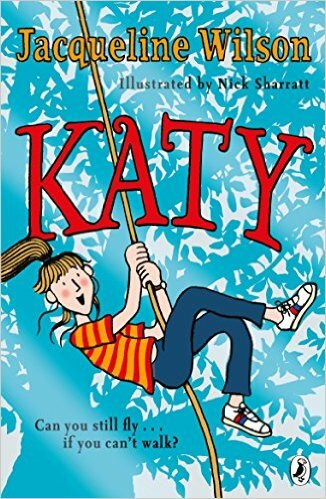 In this story Katy Carr is the eldest of six, a daredevil, fun loving sister who likes nothing more than climbing on the garage roof, skateboarding and swinging in the trees but when an accident happens and disaster strikes, can Katy and her family overcome adversity and come out the other side together? Immediately looking at this book it is longer and much harder to read than 'Rent a Bridesmaid', the words are smaller and the pages are full of writing with only pictures for the chapter markings. This book is aimed at the 7-9 year old age group but even with Little 1 being fab at reading I think it is more aimed at the end of the bracket and even older, especially considering the content. 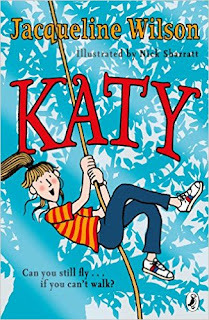 The story starts off in usual Wilson style with fun and laughs following the storyline of Katy, living with her half and step siblings all trying to get along, poor Katy seems to always get into trouble even when she really is trying to be good. But then one day, when Katy is grounded following yet another incident, life takes a rather serious turn when an accident happens and Katy's life is turned upside down. From then on the story, still with funny bits, takes on a darker and more serious tone. 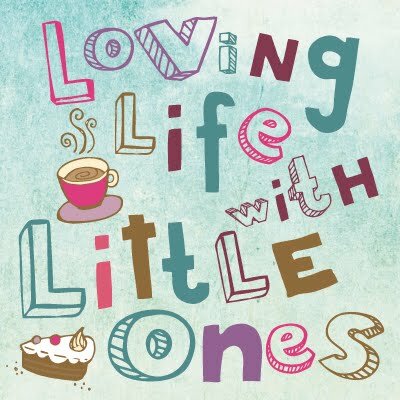 I have to be honest and say Little 1 and I started reading this book at bedtime on holiday and I tended to read the book to her rather than her read it as it was not an easy read. Late nights on holiday gave way to little time for tired girls bedtime stories and I continued to read the book by myself having not taken any reading matter of my own away with me. Little 1 did not ask for the book on return from holiday and after reading it myself I think I will hang on to it for a while and perhaps give it to her again when she is a little older. Whilst the story was very well written, covering a difficult subject, the second half of the book was quite sombre and would have been difficult for Little 1 to understand and comprehend. There were also elements in the book that as a parent of an impressionable young girl I deemed inappropriate for the suggested age range. As I read I noticed no less than 4 references to the characters referring to wanting to be thin or not wanting to eat. Early in the book one character says, when talking about what they want to be when they grow up, 'I want to stay quite thin, but much curvier, you know..'. At one point when Katy reaches her lowest following the accident and needing help with her personal care she stops eating and, one line reads 'You are not trying to starve yourself to death, are you?'. Little 1 is nearly 7 years old and has no worries about her body image, she eats like a horse and is slim, fit and healthy. As a parent I did have to question whether these lines are really appropriate for young girls to read (considering the suggested age range for the book). Yes, a couple of them were within the parameters of the storyline and may have been glossed over by the child reading the book however surely the author could have gotten the point across without saying quite those words. Overall the book was a good read covering a difficult and thoughtful subject however I felt it was more suited to an older child due to the content of the story.